Guys, Citrawarna is back in town! To all Malaysian dance lovers, do come and enjoy the merriment right here in KL with the theme of 'The Sunrise, The Green and The Echo Within'. 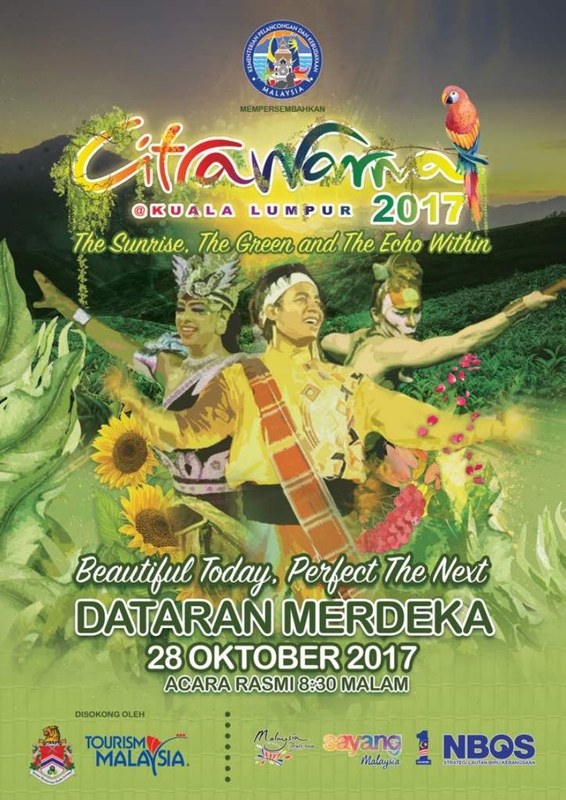 Citrawarna@Kuala Lumpur 2017 will feature a mix of musical and dance performances set against the backdrop inspired by the tropical rainforest and the beautiful seas of Malaysia. This year, the event are held on 28 October (Saturday) at Dataran Merdeka, Kuala Lumpur, organized by Ministry of Tourism and Cukture Malaysia (MOTAC). Speaking at the media session in conjunction with the launching of Citrawarna@Kuala Lumpur 2017 YB Dato' Seri Mohamed Nazri bin Abdul Aziz, Minister of Tourism and Cultural Malaysia said the ministry hoped to ensure that the Citrawarna this year would be a platform to deliver the message of importance of nature not only in form of culture but also in arts, heritage and lifestyle. "Most people does not realize that our culture is strongly influenced by the nature - for example, Dance inluenced from animal movements, Traditional costumes such as harvest feast or Nine Emperor Gods for chinese fisherman, Heritage-like flowers in woven, paintings and engravings. At the same time, the event will pose as promotional tool for ecotourism in the country through performances, singing, lighting and sound." he said. Citrawarna@Kuala Lumpur 2017 was taking the inspiration from the World Tourism Day's theme: "Sustainable Tourism - A Tool for Development", which was celebrated last month. 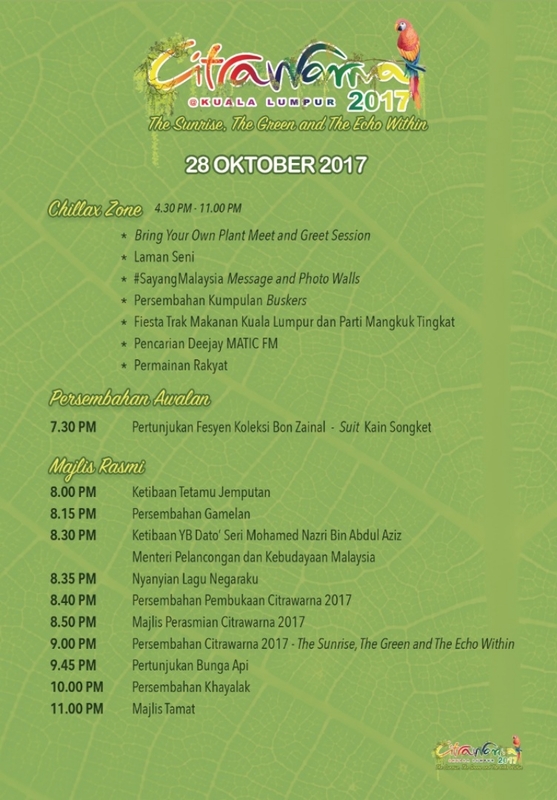 It willbe a platform to deliver the message of importance of nature not only in the form of culture, but in arts and Malaysian heritage. This year's Citrawarna featured a unique combination of dance theater elements, musicals and street parades while in 2015 and 2016, the concept presented were the theatrical combination of stage performance with street parade. Citrawarna always come up with a new, fresh and creative concept every year since 1999. The event begin at 4:30 pm with various activities set to entertain the visitors at the Chillax Zone (a designated area surrounding the Merdeka Square flaf pole), including Buskers performance, a Food Truck Fiesta, traditional games such as Galah Panjang (Long Elephant), Batu Seremban (Tossing the stones), Congkak (Filling the Wooden Board) and Zero Point as well as a photo wall called #SayangMalaysia for visitors to express their love for Malaysia. Dato' Seri Mohamed Nazri said, "There are side events that will be organised to boost Citrawarna@Kuala Lumpur 2017 such as Kids Eco Dash Citrawarna 2017 on 28 October 2017, from 7:30 am at Taman Eko Rimba, Bukit Nanas, Kuala Lumpur. This is a special running event or mini marathon for children aged between 4 - 14 years old.". And there will be the "Bring Your Own Plant" Programme at the same venue in collaboration with Locco and Daun which invites visitors to donate a plant together witha special message to Mother Nature. Interested donors, moreover, are encouraged to use carbon-free public services like LRT and mRT to bring the plants to the venue. Moreover, the Food Truck Fiesta will feature a 'Cashless' food purchasing method using smartpones through mobile wallet apps with the collaboration of BARRA and BOOST (subsiadiary of Axiata Group). Dah pergi! Tapi sejujurnya, saya sukakan tahun lepas punya Citrawarna. hihi. Apapun, tahun ni punya masih menarik dan happening. Pengisiannya pun nampak mempromosikan produk eko-pelancongan di Malaysia! Good job! Ehh Never know such things exist. Will look out for next year's then! Too bad I can't make it there, I was occupied that day. Should try to be there next year. Tak mampu nak join..mampu tgok kawan2 post je..tp SA tau sambutan sangat hebat kan..rasa rugi plak x pergi..
Sure ramai org. Teringin nak pergi but pening kepala crowd ramai. I demand more pictures! where are the nom nom picturessss haha..
Tahun ni kita tak sempat nak pergi Citrawarna Malaysia selalu kita tengok kat TV jer memang meriah dan suka tengok persembahan mereka menarik ramai pelancong datang sini..
First time pergi Citrawarna aritu memang happening sangat sangat. Looking forward for the next one! Tak pernah pergi tengok Citrawarna. Tapi kawan-kawan setiap tahun pergi menari Citrawarna. Hehe. Tengok kat TV ajelah. Nak pergi menari tak berbakat lah pulak. Selaku bekas Artis Sukma mesti uols penah join kan.
Bestnya kalau dapat pergi event ni . Happening betul event citrawarna ni. Tapi event macam ni AS selalu elak, sebab anak-anak kecil lagi..huhuhu takut anak hilang haha. Tengok kat tv je lah kot kalau teringin sangat. I would have loved to attend but had a doctor's appointment in Ipoh that I could no longer postpone. Had already waited for two weeks. Haiyoooo... hope I can go next year! 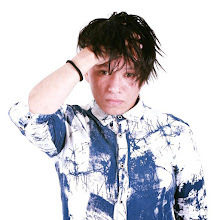 Eh ni dah lepas dah kan. Ingatkan Rawlins ada gambar dan video Citrawarna. Baru nak mencilok beberapa keping kerana akak belum publish lg. HAHAHAHAH! That look so nice. Tahun depan sure ada lagi tak? Wow this such an interesting and great event! I wish I could go there! Best nyer event ini, setiap tahun ada kat Dataran Merdeka and many will bring their family and friends. Seems like there are so many interesting events or festivals lately. This looks fun!